J. R. Carpenter is a Canadian artist, performer, poet, novelist, new media writer and researcher based in South Devon, England. Her work is interesting and entertaining, creatively using software and narrative to take the reader on explorations of community, animal companions, and the lives of writers and artists. She began using the Internet as a medium for the creation and dissemination of non-linear narratives in 1993. Since that time, her work has been presented in journals, festivals, and museums around the world, including the Electronic Literature Collection, the Museum of Contemporary Canadian Art; Montréal Museum of Fine Arts; Istanbul Contemporary Art Museum; The Art Gallery, Tasmania; The University of Maryland; Jyväskylä Art Museum, Finland; Kipp Gallery, Indiana University of Pennsylvania; E-Poetry, Barcelona, Spain; the Arnolfini Gallery, Bristol, England; and The Banff Centre, Canada. In her statement for Authoring Software, she describes the creation of Entre Ville, a new media work of locative poetry which uses an interactive graphic as an opening interface to poetry, image, and video about a vibrant Montréal neighborhood. Entre Ville was commissioned in 2006 by OBORO for the 50th Anniversary of the Conseil des Arts de Montréal. It was published in the Electronic Literature Collection, Volume Two. The most important authoring tool used in the creation of Entre Ville is the pen. The main interface was drawn with a pen in a notebook in 1992 while I was apartment-hunting in the Mile End neighbourhood of Montreal, the neighbourhood Entre Ville is set in. I saved the physical notebook because I liked the drawing, though I had no idea what if anything I'd ever do with it. 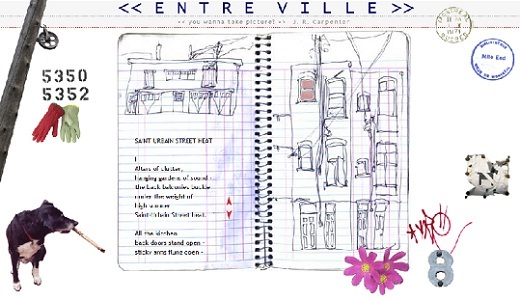 I also used a pen to write the poem, "Saint-Urbain Street Heat," which Entre Ville is based on. I almost always write with a pen first, before editing on the computer. In particular, a Japan Sailor fountain pen. "Saint-Urbain Street Heat" was written in 2004 during a record-breaking heat wave in Montreal. I went down to Vermont to escape and wrote and rewrote many drafts with the Japan Sailor in a hammock with no computer access. Although I did eventually edit the poem slightly in Microsoft Word, I think the poem retains a certain structure that might have been quite different if I'd been working on the computer all along. The poem "Saint-Urbain Street Heat" was published in an online journal based in the UK called NthPosition in August 2005. The response was overwhelmingly positive, so I decided I wanted to do more with the text - expand it into an electronic literature project. I borrowed a video camera and started shooting footage in the network of back alleyways referred to in the text. In the fall of 2005 I was commissioned by Oboro, an artist-run center and new media lab in Montreal, to create a new web based work for the 50th anniversary of the Conseil des Arts de Montreal. The commission included a month's worth of time in the Oboro New Media Lab, which is where I edited the 17 Quicktime Videos included in Entre Ville. I edited in FinalCut Pro and used Cleaner to export and crop the videos - approximately half are cropped to unconventional shapes. As I was editing the videos I uncovered the old notebook with the line-drawing of Mile End apartment buildings that I'd drawn in 1992 when first moving into the neighborhood. I decided this would be the interface and planned all the rest of the content around it. I used a now ancient version of Photoshop to splice the notebook drawing into small sections so that they could become roll-overs. I also used Photoshop to process all the other interface images. Some images were made from scanned objects, but most of the interface images were derived from digital photos taken expressly for this project, and/or video stills taken from the footage shot for this project. For the web implementation I used Homesite, an old web authoring tool that has since been absorbed into the Dreamweaver codebase. I prefer the text only web authoring environment of Homesite and have been using it for so long I see no reason to change. When I first started making web-based work there were no WYSIWYG editors and I never got used to them. I spent a number of years working in the software industry and came to loathe the version release sales model. Since then I have been working entirely independently - I have no money to update software and do everything possible to avoid software solutions. The text of the poem "Saint-Urbain Street Heat" appears in an < iframe > overlapping the notebook drawing. It scrolls with a DHTML script that I've used in other projects. The main interface component, the notebook drawing, uses a simple image rollover script to call up popup windows containing Quicktime videos and other subsections of the poem. Other small images float around the notebook drawings in relative position < div >. A number of these small images, as well as a few text areas (such as the description line under the main title) are nested in data arrays set to display randomly, so that whenever one views the page one sees a slightly different combination of images and texts. I intend this to mimic the way the neighbourhood always looks a little bit different every time one goes out into it.